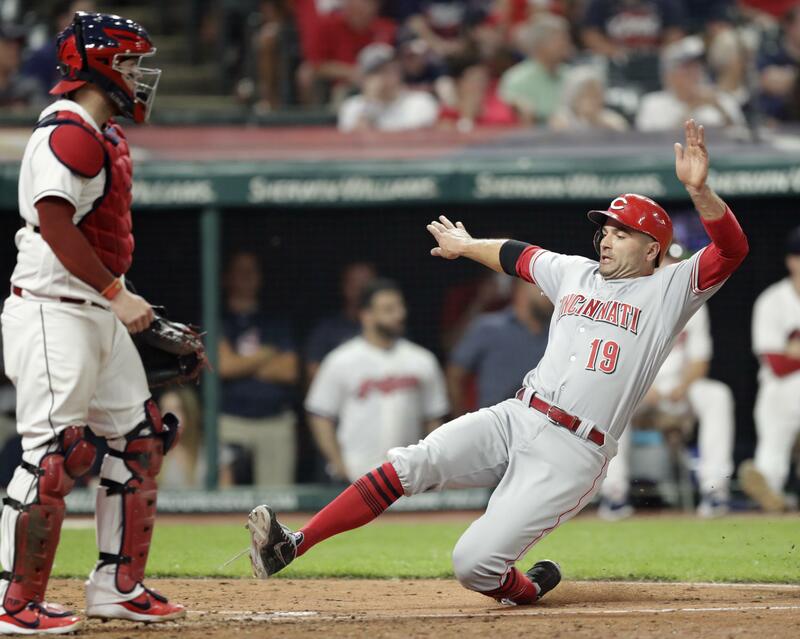 Tue., July 10, 2018, 11:03 p.m.
CLEVELAND – Joey Votto hit a go-ahead three-run double during a seven-run ninth inning and the Cleveland Indians bullpen wasted a gem from Trevor Bauer in a 7-4 loss to the Cincinnati Reds on Tuesday night. RED SOX 8, RANGERS 4: At Boston, Andrew Benintendi bolstered his All-Star credentials with a pair of doubles and two RBIs in his final game before fan votes are tallied, and Boston extended its winning streak to eight games. RAYS 5, TIGERS 2: At St. Petersburg, Florida, Wilson Ramos hit a three-run homer, five Tampa Bay pitchers combined on a five-hitter and the Rays beat Detroit. BREWERS 8, MARLINS 4: At Miami, Christian Yelich had three hits and four RBIs, Travis Shaw homered and Milwaukee beat Miami. PHILLIES 7, METS 3: At New York, Enyel De Los Santos won his major league debut and Philadelphia got home runs from Maikel Franco and Odubel Herrera in a victory over New York. ORIOLES 6, YANKEES 5: At Baltimore, Manny Machado hit two home runs, Jonathan Schoop singled in the winning run with two outs in the ninth inning, and Baltimore rallied past New York. BLUE JAYS 6, BRAVES 2: At Atlanta, Russell Martin’s sharp single in Toronto’s five-run eighth drove in the go-ahead run, Marcus Stroman allowed pitched seven strong innings, and Toronto beat Atlanta to knock the Braves out of first place. NATIONALS 5, PIRATES 1: At Pittsburgh, Anthony Rendon hit a two-run homer, Daniel Murphy doubled twice and had four hits, and Washington beat Pittsburgh. ASTROS 6, ATHLETICS 5, 11 INNINGS: At Houston, Alex Bregman homered twice and his tapper just in front of the plate in the 11th inning led to a bizarre play that ended the game, as catcher Jonathan Lucroy’s throwing error handed Houston a wild victory over Oakland. CARDINALS 14, WHITE SOX 2: At Chicago, Dexter Fowler broke out of a slump with his fourth career grand slam, Miles Mikolas tossed six innings of three-hit ball and St. Louis routed Chicago. ROYALS 9, TWINS 4: At Minneapolis, Adalberto Mondesi had a three-run homer and a career-high four RBIs to help Kansas City snap a 10-game skid. PADRES 4, DODGERS 1: At San Diego, Rookie left-hander Eric Lauer came within one out of his first career complete game before allowing Max Muncy’s home run, and Wil Myers homered for the sixth time in four games to lead San Diego. DIAMONDBACKS 5, ROCKIES 3: At Denver, David Peralta and A.J. Pollock homered in Arizona’s four-run seventh inning, and the Diamondbacks won for the fourth straight time at Coors Field. CUBS 2, GIANTS 0: At San Francisco, Victor Caratini hit an RBI double during a decisive seventh inning, helping Chicago back Jose Quintana in a close game. ANGELS 9, MARINERS 3: At Anaheim, California, Kole Calhoun and Andrelton Simmons each had three hits and two RBIs to lead Los Angeles over Seattle. Published: July 10, 2018, 11:03 p.m.